The image of a cryptocurrency investor is changing rapidly. If five years ago the topic appealed only to fans without major funds, nowadays big players and institutions are getting involved in the industry. For example, 29% of millionaires, whose combined wealth is $70 trillion, are ready to invest in cryptocurrency and almost just as many (27%) are interested in the topic. In addition, more and more regular people have decided to start off their investment journey directly in the cryptoindustry, bypassing traditional investment tools. It’s interesting that the number of women keen on investing in cryptocurrency has more than doubled in six months: from 6% at the beginning of 2018 to 13% in June. Playkey has created its own snapshot of cryptocurrency investors by researching backers and asking them how they decide which project to support and which tools they use. To do this, we independently interviewed English speakers and Russian speakers. There are few true novices among English-speaking cryptocurrency backers. 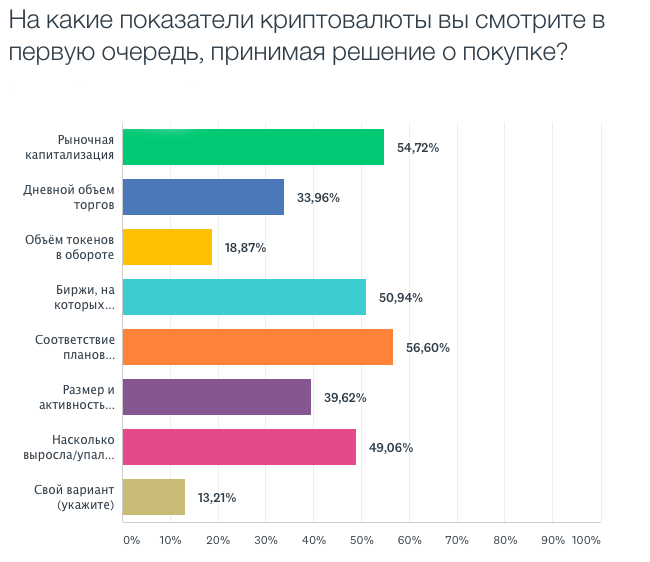 Only 25% of both English-speaking and Russian-speaking investors joined the industry less than six months ago. 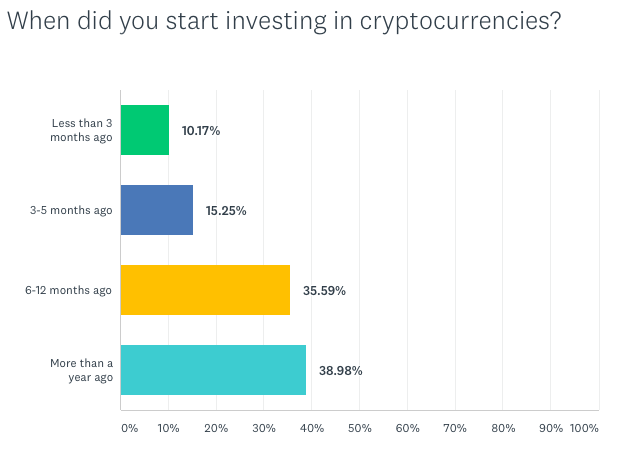 Most survey respondents have been investing in cryptocurrency for more than a year. 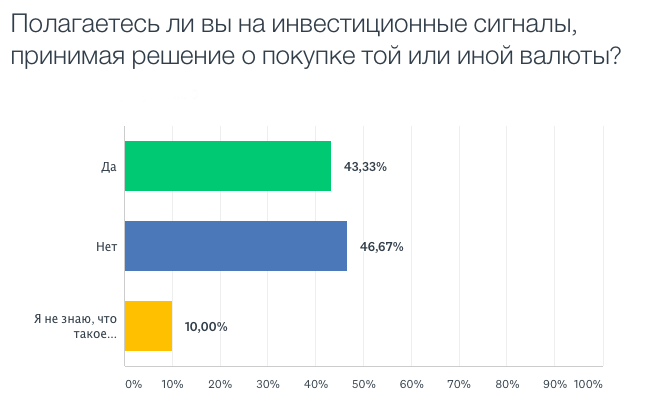 Those who have been in the industry six months to a year number slightly less: 39% and 36% respectively. 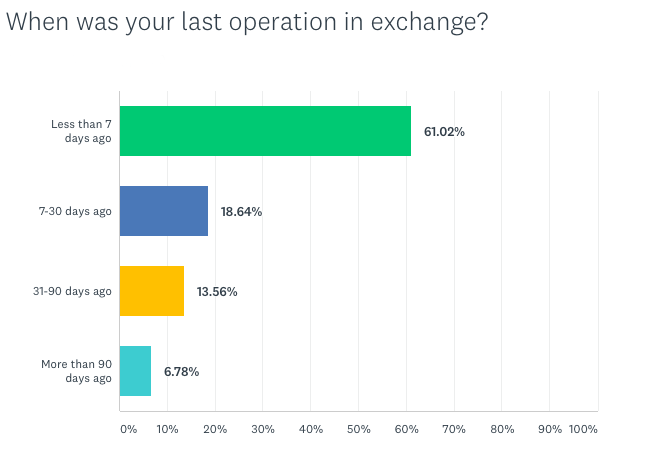 They invest regularly: more than 60% of respondents had made their most recent transaction within the past week. Those who had not made any transactions within the past three months totaled only 7%. The portfolio size of most backers (one-third) is of average size, from $1,000 to $10,000. One fourth of respondents are major investors with portfolios of more than $50,000. Another quarter of respondents have smaller portfolios worth less than $1,000. English-speaking investors don’t limit themselves to just one cryptocurrency. The biggest category of investors (37%) have two to five kinds of tokens in their portfolios. In second place are those who have more than 10 kinds of cryptocurrencies (34%). 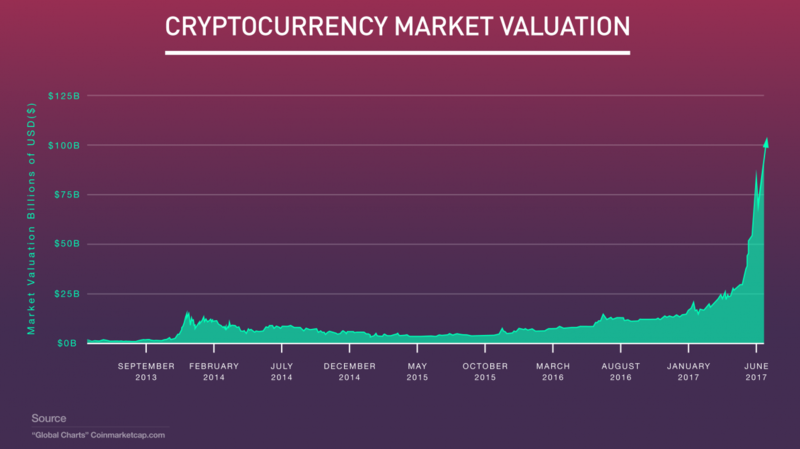 Only 5% of investors have just a single cryptocurrency. In regards to exchanges, English-speaking investors are very flexible. 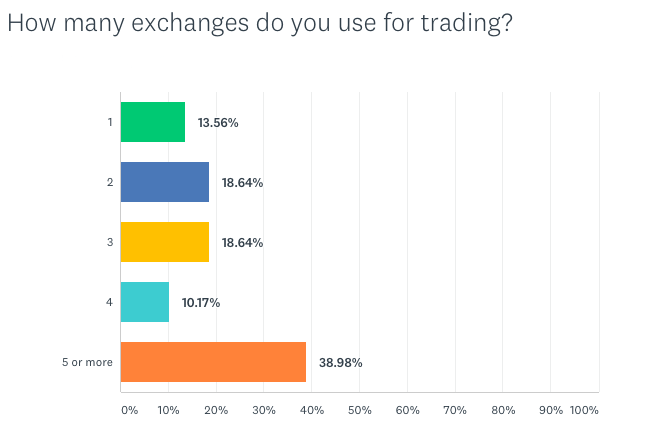 A significant number of those surveyed (39%) conduct transactions on more than five exchanges simultaneously. Only 13% of investors trade on just one exchange. 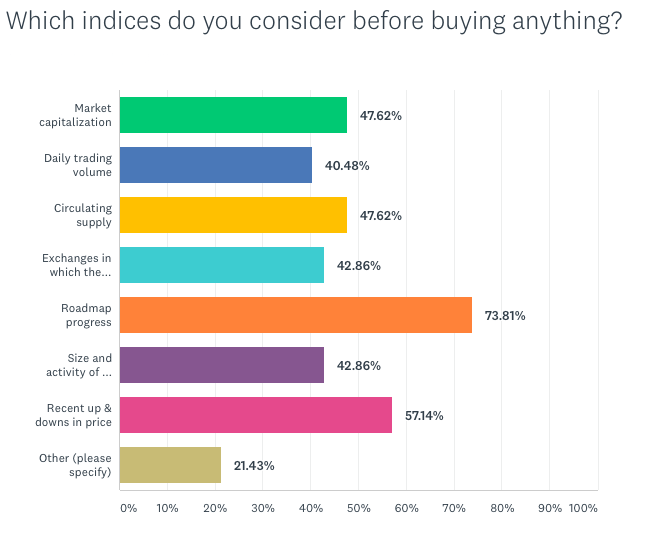 When making decisions, most English-speaking investors (59%) are guided by investment signals, or calls to buy or sell a cryptocurrency based on the analysis of a person or generated by a computer using specific market signs and algorithms. Different sources of information include Telegram channels, mass media, and industry resources like Cointelegraph, Coinmarketcap, Tradingview, ICOratings, and so on. In summary, English-speaking investors are generally experienced market participants who prefer to diversify risks, trade different currencies on different exchanges, and carefully study projects before adding tokens to their portfolio. 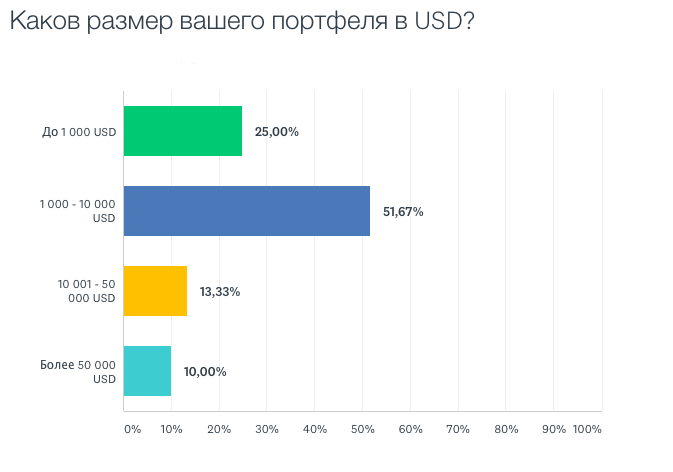 Among Russian-speaking investors, only 22% of those surveyed said they had been trading in cryptocurrency for more than a year. 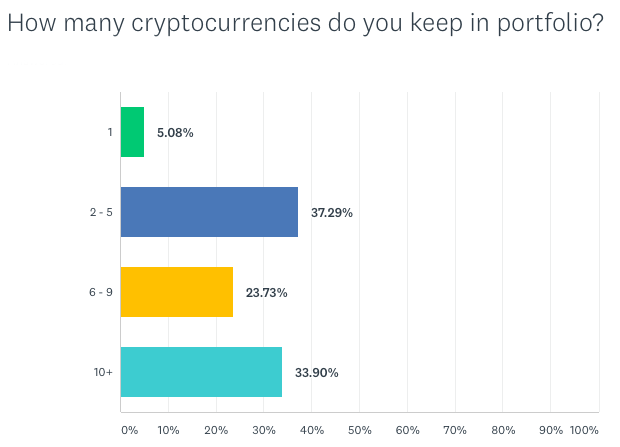 The majority of them (55%) have been involved with the cryptocurrency market 6 to 12 months. 67% of them actively participate in the market, having conducted a recent transaction within seven days of the survey. The portfolios in this group are generally of average size. 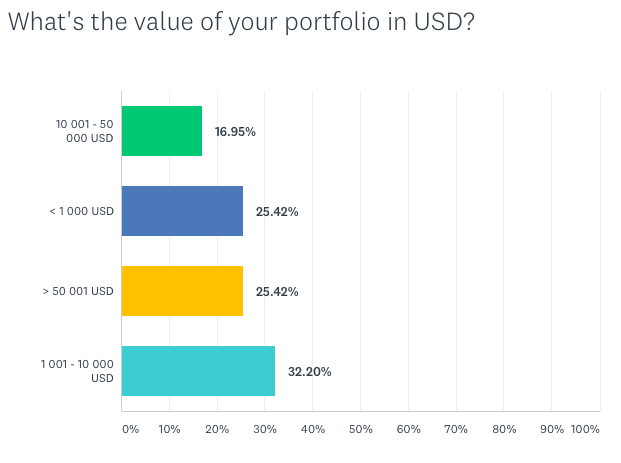 52% of respondents have a portfolio containing $1,000 to $10,000. One quarter of the investors are small investors with portfolios of less than $1,000. Major investors are even fewer in number. Having 2 to 5 cryptocurrencies in a portfolio is the most popular choice. Another quarter of investors have 6 to 10 different kinds of tokens. Like with English-speaking investors, having just one cryptocurrency is not an attractive choice. Only 7% of respondents have such a portfolio. 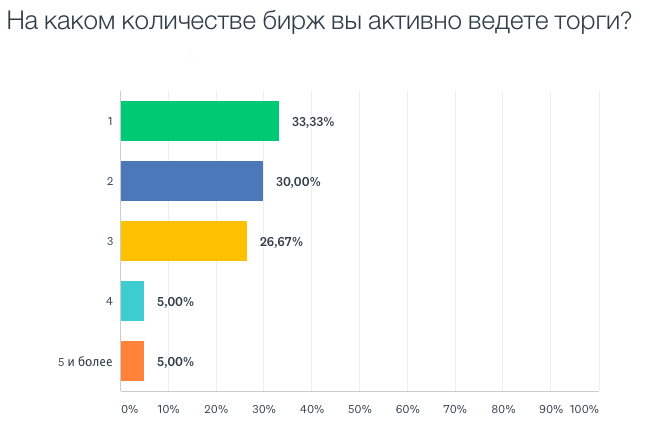 Russian-speaking cryptocurrency investors prefer to trust a single exchange; more than a third of them trade on just one platform. 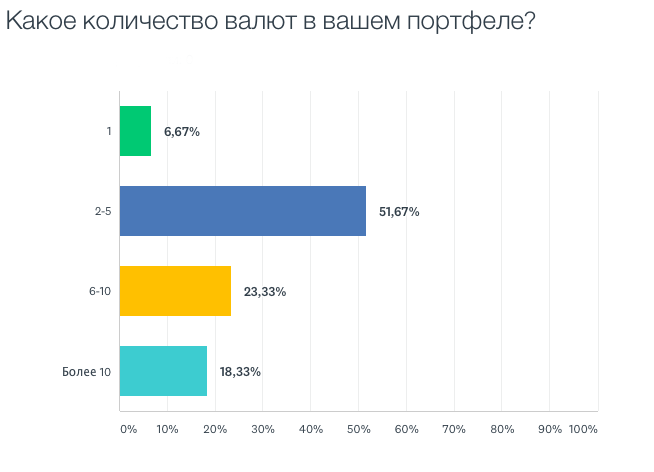 On the other hand, trading on two platforms and on three platforms is also fairly popular — 30% and 27% respectively. The top 5 exchanges are similar to those frequented by English speakers with just one exception: Poloniex takes the place of Bitfinex on this list. The numbers of those who pay attention to investment signals and those who don’t are almost equal. 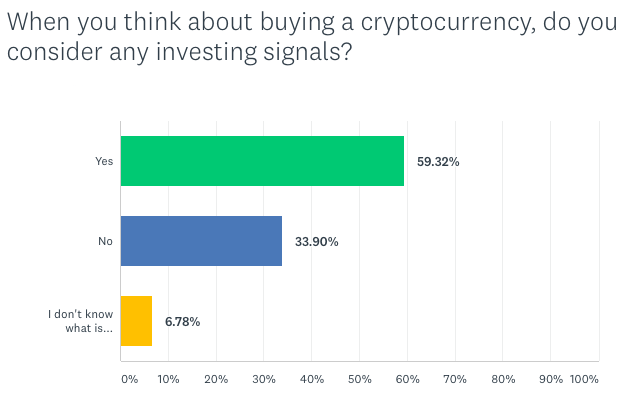 There were slightly more investors (47%) who don’t pay attention to those signals than investors who do (43%). 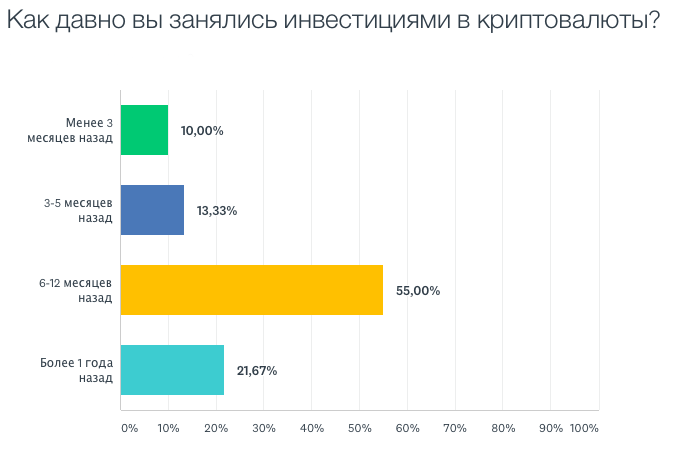 Ultimately, although Russian-speaking investors have less experience, this market segment is growing and developing in the footsteps of the English-speaking backers. Both categories of investors have a lot in common in terms of investment tools and decision-making factors. They’re interested in the same exchanges, they trust bloggers and cryptocurrency platforms, and they pay close attention to the progress of projects and whether goals have been met. In today’s climate, only projects that develop in two directions at once can succeed and attract new participants to one’s ecosystem, by delivering what was promised at the ICO stage and developing one’s community. By the way, backers are talking right now about both the project and the market in general on all of Playkey’s channels (Telegram, Facebook, Twitter, Reddit). Join the conversation!